Spirit of Black Paris: What's the Focus of Black History Month in Paris? What's the Focus of Black History Month in Paris? Ever wonder how Black History Month is marked in Paris and across France? What historical figures do the French admire or revile? What kinds of events are organized? BHM is observed internationally throughout the entire month of February - from major UNESCO initiatives to the United Nations’ 2013 launch of the Decade of People of African Descent. 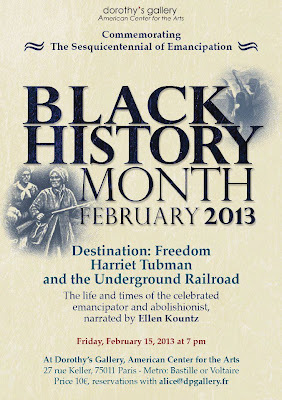 Then there are dozenss of local events that celebrate, restore or debate Black life, culture and experience. In Anglophone Paris, there are a smattering of Black History Month events held by the mainstay American cultural institutions such The American Church, The American Library, The American Embassy, or Dorothy’s Gallery. But some French organizations go well beyond celebratory soirées and dive deep into tabling still-stinging memories. One hot button is France's colonial history. 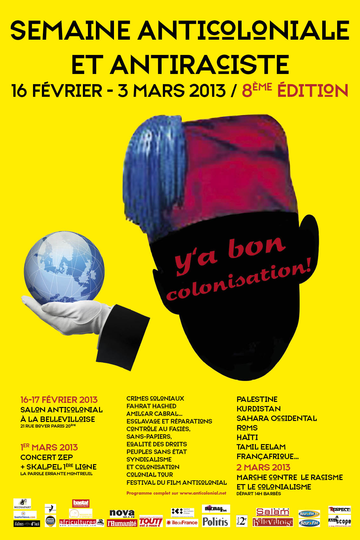 This year, an association called ‘Sortir du Colonialisme - Beyond Colonialism’ is holding their 8th annual Anti-Colonialism and Anti-Racist Week from February 16 to March 3rd. 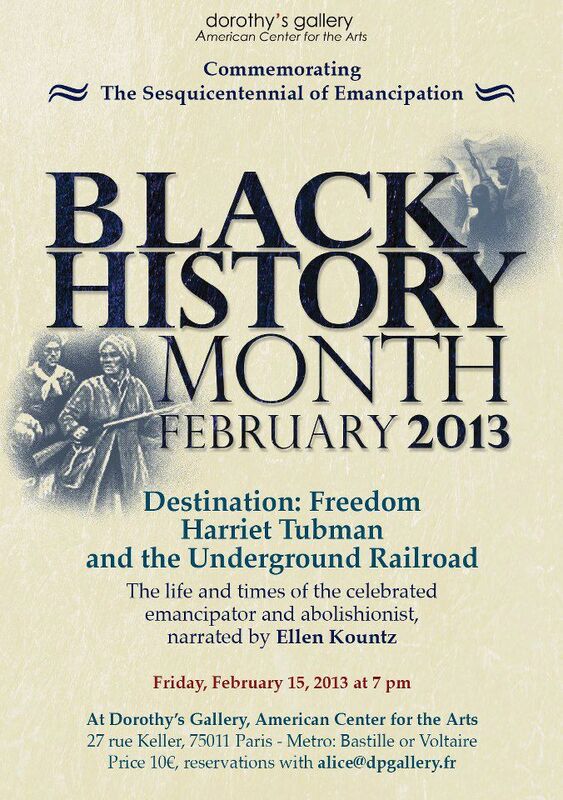 Up to this point, it was not part of the Black History Month official events but this year’s dates coincide with BHM. In an effort to develop bridges between militant groups, the organizers of 2013 Black History Month have invited the ‘Beyond Colonialism’ Association to include their anti-colonial program into this year’s BHM events. As the event title suggests, the association’s message is not limited to building and commemorating awareness of African Diaspora history. Their anti-colonial spotlight focuses instead on France’s wide net of former colonies, including North and sub-Saharan Africa, South East Asia, Caribbean and Pacific Islands, Middle East and stretches back to the slave trade. For Black History Month program organizers, this expanded historical focus has made French colonialism one of the themes of BHM. 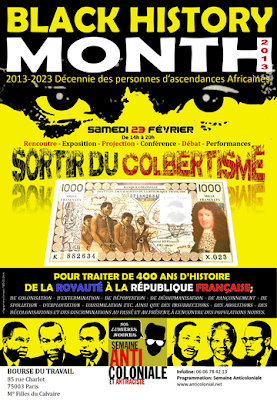 The theme entitled 'Sortir du Colbertisme - Beyond Colbertism’ covers 400 Years of History - from Royalty to the Republic. Who is Colbert? : Jean-Baptiste Colbert was the Minister of Finance under King Louis XIV in the 15th century. He was known to be thrifty, and worked hard at creating a favorable balance of trade, and that included increasing France’s colonial holdings. 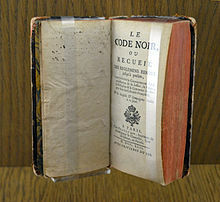 He also created the first version of the notorious Code Noir. In this 1685 law, he defined the conditions of slavery in the French colonial empire and restricted the activities of free Blacks. The final version was passed in 1724 then applied in the West Indies, Guyana, Reunion and Louisiana. The ‘Beyond Colbertism’ theme for Black History Month 2013 brings to the table discussions on means used against the black populations: the plans of French colonialism, extermination, deportation, dehumanization, kidnapping, deprivation, exploitation, assimilation. Add to that, insurrections, abolition and decolonialization, and discrimination past and present. 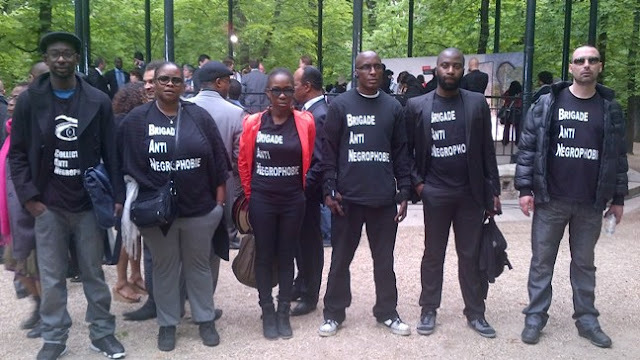 Anti-Negrophobie Brigade at the May 10th Abolition of Slavery Commemoration in Luxembourg Gardens 2012. • MIR France : Mouvement International pour les Réparations - The International Movement for Reparations. • V-V : Collectif Vies Volées (France) The Stolen Lives Collective. ** May 10th= In 2001, the Senate voted in The Taubira Law, recognizing slavery as a crime against humanity. In mainland France, this is the annual date of commemoration of the abolition of slavery. It is also, interestingly enough, the death date of King Louis XV, who passed the final Code Noir. Here are just a few events still upcoming for the Anti-Colonialism & Anti-Racist Week 2013. They include literary, discussions, film screenings, brunch, protest march. Researchers: you’ll find here in the program useful names and addresses of organizations, lecture halls. Friday 01 March - Conference ‘Discrimination, extreme right wing, islamaphobia’. Saturday March 2 - Conference: Colonial Crimes and Memory Gaps - a French Specialty? The case of Cameroon. Sunday March 3 - Forum on African music. “‘y’a bon’ - it’s good”. 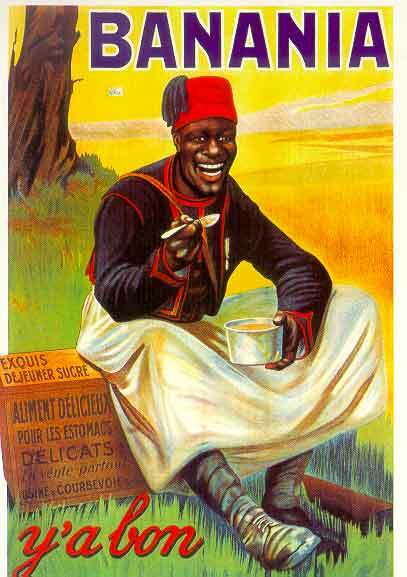 The French public found the image and the soldiers endearing but the Collective from Antilles, Guyana and the Reunion Islands declared the slogan racist. Although the image was withdrawn in 1977, the image still provokes debates on France’s colonial past. Thanks for bringing together various events, ideas re history of African-fathered people from around the world. Colonialism is so critical to the understanding of present life in this world. I am in Wash,DC..we in America are still struggling to make sense of our past and present. Having a President of color is amazing..
then what?? what to do ..to expect..to work towards?? Thanks for your research, etc. I greatly appreciate the work you're putting in here.